Ah, spring is in the air. 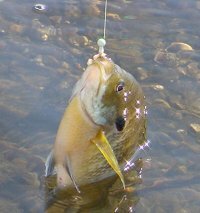 Rivers are flowing, lakes are opening up and the panfish are already paying a visit to their early spring hangouts to start another open water fishing season. 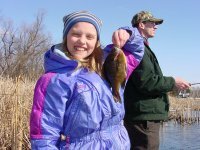 With all of the hubub that goes into getting ready for the fishing opener, it can be easy to miss the signs of one of the season’s earliest fishing opportunities. Here are a few simple tips that can help you cash in on a bonus season that's already underway on a lot of Northern Minnesota lakes. First tip, don't wait too long too long before you start looking. We all have a tendency to wait until we hear from someone else that the fish have started moving in spring, but this is one time when you want to be the first one to find out if they're in. These brief forays into the shallows are "pre-spawn" feeding movements, so the fish come and go as the food supplies vary. There's no doubt that some days are better than others and it pays to watch for the signs and try to be ready to go at your first chance. Warm; sunny spring days work quickly to open the isolated back bays and channels where panfish will make their first early season feeding runs. It's not uncommon for the fish to move into these areas for a short time while conditions are good, only to leave when the weather turns cloudy or colder. One key tip is that you're looking for places that will warm quickly and hold heat for a while. Locations like mud flats, weedbeds that contain Coontail, Northern Milfoil or Cattails are all good examples of locations where water will warm quickly producing early hatches of insects and crustaceans that attract these early panfish. The key is the darker surfaces that gather heat in a hurry. Even murky water can help to warm an area and provide early feeding opportunities for panfish. These areas will often open up several days or more before the ice breaks up on the main lake and it's not uncommon to catch fish in these spots within a day or two after break up. Narrow channels, inlets and boat harbors are also good places to search during spring break up. 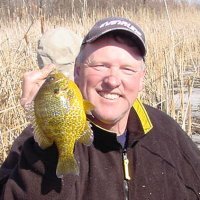 Clear water, hard bottom areas with sand or gravel are not likely to produce these early season panfish, but keep an eye on areas with heavy Bulrushes or areas with a soft cover over sand. In a few weeks, panfish will begin using these areas as they prepare to spawn. I like to make a trip into some of these shallow areas and look for last years "spawning beds", the shallow dish-like depressions that panfish create by fanning the soft material away from the harder bottom below it. When I locate these old-spawning areas, I'll make note of them and remember to return when the water warms and spawning begins. Even then, the fish will move in and out with the changing weather conditions. It pays to gear up for variety because this early breakup pattern can work for Crappies, Bluegills and Perch. So depending on the lake or river stretch that you fish, it's possible to catch any of these fish in and around the same general area. It's good to have a variety of baits in case you stumble into an unexpected group of fish that you weren't looking for. Minnows are generally better for Crappies and Perch, while waxworms, angleworms or other grubs are better suited for Bluegill. Plain hooks, small jigs or even ice flies will all work and during early spring. Marabou and other small feather jigs add to the natural attractive qualities and are among my favorite jigs for spring bluegill fishing. I believe darker, more natural colors will often produce fish better than the brightly colored jigs we use for ice fishing. It's important to remember that these fish are already coming into the shallows to feed, so colorful, attracting baits are less important than at other times. This is a time when we should put more emphasis on baits that look like real food. This will help trigger more bites from the feeding panfish. Combinations with Purple, Brown, Black and Plain White are all colors that work well for me in springtime. A few bobbers and a nice long rod rigged with 4 pound test line is plenty to get you started. Because you’re fishing in such shallow water, you'll usually need floats to keep your bait in the strike zone and out of the mud. I like the small Thill slip bobbers from Lindy, it’s a nice balsa wood float with decent weight for casting, they’re brightly colored and my line always feeds out smoothly. Rods for this light tackle need to be lightweight, sensitive and long enough to cast small baits effectively. I like G.Loomis Rods, so I use their seven foot SR-842 for this. The extra length allows me to get the light baits out farther and make setting the hook easier too. I consider this to be one of the ultimate fishing rods anywhere and I use it in many other situations where light line and small jigs are required. No matter which rod you choose, longer and lighter will generally fit the circumstances. Too heavy or too short makes it harder to cast these light baits and makes it harder to protect your light line from breaking. Before you start packing all of your gear in the boat, consider that early spring fishing for panfish might just be one of the few times each year when folks fishing from some shore spots could have an advantage over those of us out in the boat. Narrow channels, inlets and boat harbors are well suited to fishing from shore and so are the popular public fishing piers. The shore angler has two main advantages; first it's easier to fish quietly and second, fish that are hooked and reeled toward the shore have the effect of drawing other fish in with them. This helps to keep fish in the area for longer periods of time and allows the angler to spend his fishing time really efficiently. Often, the fishing will actually get better as the day goes on. Fishing these areas by boat can still be effective and there are plenty of good areas that can only be reached by boat, but you’ll want to be careful not to have too much unnecessary commotion causing noises that will “spook” the fish moving them back out into the lake. In the past we’ve seen schools of fish move out ahead of the boat and eventually escape around us and return to the safety of the main lake. Once they leave, they don’t come back for a while, so it's important to keep a low profile. Occasionally, it’s a good idea to find the spot by boat, then once located, you can beach the boat and fish from shore. Anchoring is also helpful when you want to fish from a stationary position. fish and giving them an opportunity to strike. We gradually move further in to the bay or inlet until we either contact fish or decide to move to a new location. We will change baits and colors often enough to be sure that we’ve presented a good mixture. Fish the area thoroughly, but quickly. Fish coming into these areas will generally be aggressive. If you don't find them in a half-hour or so, it's time to move to a new location and try again. When you make a trip on a day where the fish just don’t seem to be in, move out to the first break into deeper water adjacent to the shallower feeding areas. Panfish will use these deeper holes as a staging area at times when cold weather blows in and interrupts their feeding routine. Fishing vertically along the deeper edges of these breaks can get you back on fish until they make their next move into the shallows. Remember that shallow water that warms quickly is also likely to cool quickly when the conditions change. The fish adapt to these changes and move in hurry. So there you have it, not too complex and perfect for fighting off that case of "spring fever". To me there's never a more rewarding fishing trip than that first time out in the spring. Why not move up your schedule and be one of the first ones to get out? I hope you'll pack up the family and give it a try this year. Chances are you’ll be glad you did.